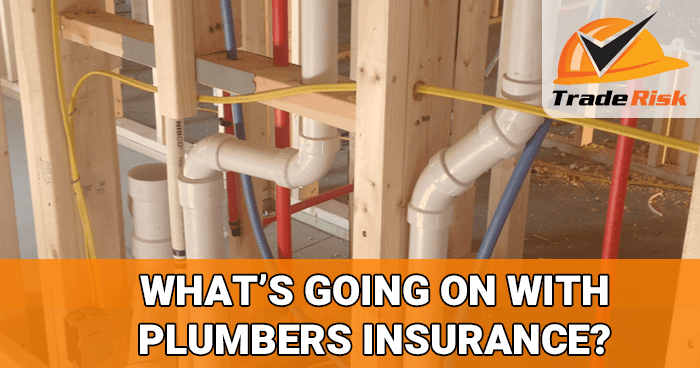 Home / What’s Going on with Plumbers Insurance? If you’re a self-employed plumber, you probably will have noticed some big changes to your business insurance lately. Here at Trade Risk we’ve been receiving more enquiries than ever from plumbers who are insured elsewhere, wanting to see what we can do for them. Why the big increase in enquiry? Because there has been a lot of change in the market when it comes to plumbers insurance, and specifically public liability for plumbers. Plumbers across the board are seeing big increases in premium, as well as having additional restrictions placed on their work. We feel it’s only fair that plumbers get an understanding of what’s going on. There are two main changes; price and restrictions on cover. On the pricing side plumbers are seeing big increases in their public liability insurance cost. Whilst all insurance premiums are going to increase a little each year due to inflation, some plumbers are seeing increases of thousands of dollars per year. Domestic plumbers won’t feel too much pain, but in commercial it’s a very different story, and we’re hearing from plumbers who’s insurance though other brokers has gone through the roof. We’re pleased to report that we’ve been able to keep our premiums for domestic plumbers steady, but for commercial plumbers we’re really in the same boat as every other insurance broker. Shopping around is the obvious answer here. It doesn’t mean you’ll always find something cheaper, but it’s definitely worth looking around. We’re getting plenty of enquiry from plumbing businesses at the moment. For some we’ve been able to save them money and bring them over to Trade Risk, whilst for others they already have a fairly competitive premium and we can’t do much more. It’s also important to let your insurance broker know exactly what type of work you’re undertaking. For example if you were doing commercial work when you took out the policy, but you’re now only doing domestic, you could avoid the big price increases. The biggest change came from leading Australian insurer CGU, who have placed a restriction on plumber’s insurance policies that limits their work to buildings of a certain height. Under their public liability policy, plumbers will only be covered for work on buildings up to three storeys. This is fine for plumbers doing domestic and light commercial maintenance work on typical houses and small unit blocks, but for anything above that you won’t be covered. The other big one isn’t so much a restriction, but more of a split in terms of how plumber’s public liability insurance policies are priced. For most typical trades, most insurers don’t differentiate between domestic, commercial and industrial work. For example if you’re a carpenter, your policy covers a carpenter regardless of the classification of the work. But now for plumbers, some insurers are treating domestic and commercial plumbers very differently. The policy issues via our online system for example now only covers domestic work. It doesn’t mean we can’t cover commercial and industrial work, it just means we have to quote it manually rather than being able to give an instant online quote. With regards to the three storey issue with CGU, you need to make sure you’re not working on larger buildings if your insurance is with CGU. At Trade Risk we have been contacting all of our plumbing clients with CGU to let them know, and moving them to a different insurer if necessary. But if you’re insured with CGU through a different broker, or directly with CGU, you need to be across this issue. We can help you out with that of course. It might also be worth checking with your insurer regardless of which insurance company you use, just to make sure the size of building you are working on is still acceptable and covered. With regards to the domestic and commercial work, it’s important to let your broker or insurer know what you’re doing. If you have a policy that covers all work but you’re only doing domestic, you might be able to save yourself thousands a year by switching to a more appropriate policy. Your broker can help you with this. On the other hand, if you’re doing commercial plumbing and potentially only have a policy which covers domestic, you better get that updated as soon as possible if you ever want a claim to be paid. As always, it’s best to check these things with your insurance broker. That’s why we’re here; to make sure you have the right policy for your needs, but we can only know that if you keep us updated on your business activities. It’s all to do with claims. The insurers have been suffering significant claims from plumbers over the last couple of years, and the only option they have is to increase premiums. As with all types of insurance, the cost is based on the risk, and the risk is ultimately about the likelihood of a claim and the size of the claim. Plumbers have suffered a double blow here, as both the frequency and size of claims has reportedly increased. We are hearing a lot of plumbers unhappy about this, as they haven’t made a claim and don’t think they should be punished with higher premium. That is 100% understandable, but for better or worse, that is how insurance works regardless of which type of insurance you have. For example, if the insurers are suffering a lot of car insurance claims from Subaru WRX owners, the cost of insuring a Subaru WRX will be higher. Or if you live in a postcode with a high level of break-ins, your home contents insurance cost will be higher regardless of whether or not you’ve suffered a break-in yourself. In terms of the types of claims causing the biggest issues, the ones we’re hearing about from the insurers are those involving water damage in multi-storey developments. The big issue seems to be water leaks where damage is caused to the plasterboard or other areas across multiple levels below were the actual leak occurred. Thankfully our clients haven’t experienced any such claims of a large size, but that’s what we’re hearing from the insurers, and that’s a big part of why premiums have been going up. If you’re only doing domestic work though, or work on buildings of three storeys or less, the good news is that your risk is not increased and therefore the premiums haven’t seen major increases. We won’t always be able to find cheaper public liability insurance for plumbing businesses, but we’ll always do our best. If you’re currently insured through a different broker or direct with an insurance company and you’re unhappy about your increased premiums, please get in touch with our team. We’ve been helping plumbers and plumbing businesses with their insurance for almost a decade and would love to help you out too. For domestic-only plumbers please click here for an instant quote, and for all others please follow this link to our quote form. If you prefer to have a chat rather than fill in forms you can contact our team on 1800 808 800 and we’ll be more than happy to run through it all with you.